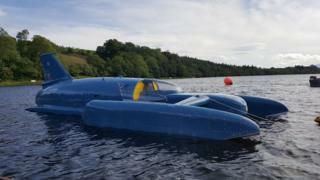 Donald Campbell's Bluebird has been launched in front of cheering crowds for the first time in over 50 years. The record-breaking hydroplane was floated as part of tests being carried out on Loch Fad on the Isle of Bute. It has been rebuilt after being recovered from the bottom of Coniston Water in 2001, following Campbell's fatal crash in 1967. The 45-year-old died trying to break his own water speed record when the Bluebird K7 flipped and crashed. A group of volunteers from Tyneside are testing the iconic craft to see if it is watertight and whether it can withstand a buffeting from the waves. Donald Campbell had been travelling at speeds of more than 300mph to break his own 276mph record when the Bluebird K7 partially disintegrated. Lead engineer Bill Smith, said it had been a "labour of love" to put the hydroplane back on water. "This project is 22 years old this year. "We've been 15 years in the rebuild - five years to strip down, catalogue and clean, and ten years since we set the first rivet to bring her back to this condition. "This is a fully working machine, completely original. This is the vehicle that Donald Campbell drove. An attempt to refloat the craft earlier in the afternoon stalled when it became snagged on the beach of the loch. However, the team said they were determined to launch it in the near perfect conditions on the Isle of Bute. Mr Smith said the Bluebird had been made to operate on the "flat calm". Tim Walsh, who is the project's lead pilot, added: "We are looking to assess how it copes with the water, are there any leaks and what challenge is there from different sizes of waves." The craft is set to undergo a battery of tests on Loch Fad over the coming weeks before it returns to Coniston next year, where it is expected to run at speed.